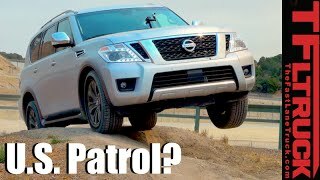 At the Chicago Auto Show 2016 Nissan unveiled its all new SUV Nissan Armada 2017. 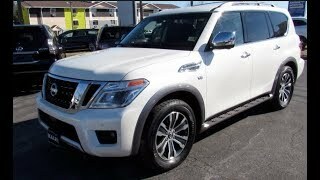 The model is based upon the Titan and Nissan Patrol which presently also get sold under the badge of Infiniti QX80. Thus the styling and details are almost same but with a hint of uniqueness. 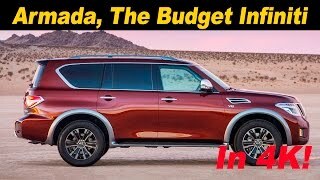 Let us have a look at the review of Nissan Armada 2017 to know in detail about it. The interior of Nissan Armada 2017 is massive beyond your expectation and when further it gets complemented by the panoramic moonroof, the feeling gets new wings. The Zero Gravity seats provide utmost comfort to the buyers while the power folding functions further commendably adds to the comfort. The HVAC vents keep the later two-row passengers comfortable while for front passenger and driver the vents are well placed on dashboard. Offering sufficient space for eight people the model isn’t just about space. It has an optional DVD system for the kids that will bring two seven-inch monitors with VTR jacks and USB support. Further you have the 13-speaker Bose sound system. 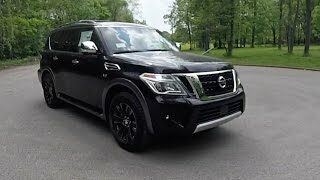 Thus rounding up the interior details of Nissan Armada 2017 I would say it is an impeccable amalgamation of comfort, leisure and technology. 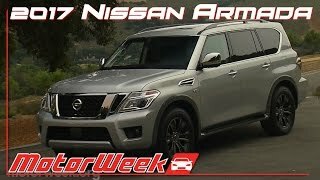 For the exterior of Nissan Armada 2017 things are pretty similar to the Nissan Patrol siblings. You can notice the similar grille however the LED projector beam headlights flanking it portray uniqueness. THe front looks sportive with the aluminum cladding at the bottom of the air vent that sits amidst the set of fog lamps. Having a look at the sides the skid plates and the 18-20 inches wheels will further add to the sportive saga. At the rear end, there is a power liftgate amidst the LED taillights. Apart from these all buyers will also get seven exterior color options and features like, two-inch receiver hitch out back, 360 degree around view monitor with radar based parking sensors. Thus rounding up the exterior details of Nissan Armada 2017 I would call it sportive and massive. Powering the Nissan Armada 2017 is a 5.6 liter V8 engine that puts out total output of 390 hp and peak torque of 544 nm mating to seven-speed automatic transmission with adaptive Shift Control and Downshift Rev Matching. Company didn’t share the performance figures of Nissan Armada 2017 till now, however we expect them to be out somewhere close to year mid.